This book is a primary reader and is based on the story 'Jake'. It focuses on home safety and highlights the many dangers small children face in the home. When the family is too busy to pay attention to him, Baby Bupe decides to play with the red 'stones' in the fire. His mother is just in time to save him from grabbing the hot cinders. 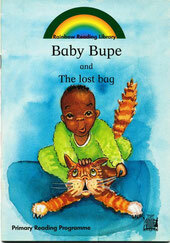 Then Bupe hides under the table and when no one finds him he pulls on the cloth and the hot tea almost spills on him. Then his father saves him from putting a plastic bag over his head, and his grandmother from eating her pills, which he thinks are sweets. When Bupe nearly drinks paraffin thinking it is a cold drink, the family decide it is time for Bupe to be strapped on his mother's back where he will be out of danger. 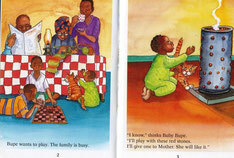 But Bupe wails that he wants to play, and they should make the house safe for him. This book was published in English and several Zambian languages. Bupe wants to play. The family is busy. "I know," thinks Baby Bupe. "I'll play with these red stones. I'll give one to Mother. She will like it."